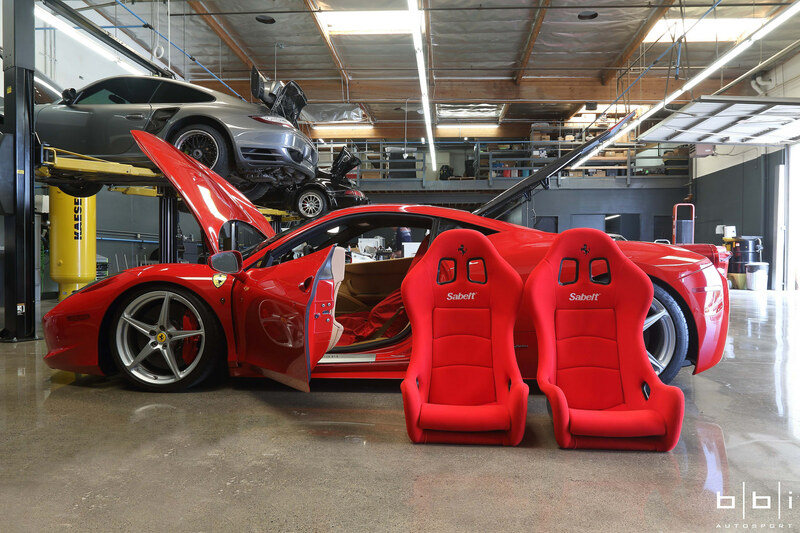 BBi Autosport, an authorized Sabelt dealer, and one of the leading performance shops in Southern California, shaved over 90 pounds from a Ferrari 458 Italia. 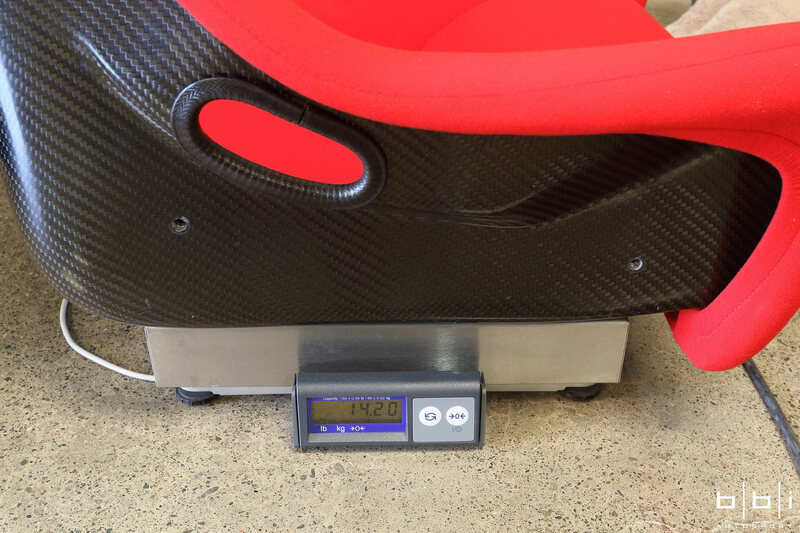 That is a significant weight savings that was achieved simply by changing out the OE seats to Sabelt carbon seats (Sabelt is also the OE supplier to Ferrari). The 562 horsepower 458 Italia is Ferrari’s primary high performance mid-engine V8 sports car sold worldwide and also the current platform homologated by Michelloto which is the racing arm for all Ferrari GT programs for professional sports car racing worldwide. A non-reclinable full bucket racing seat offers greater driver support and confidence (helps against lateral G forces while potentially lowering the center-of-gravity) during track and high performance use. This allows the driver to focus on steering inputs rather than bracing themselves in their less supportive OEM seat. 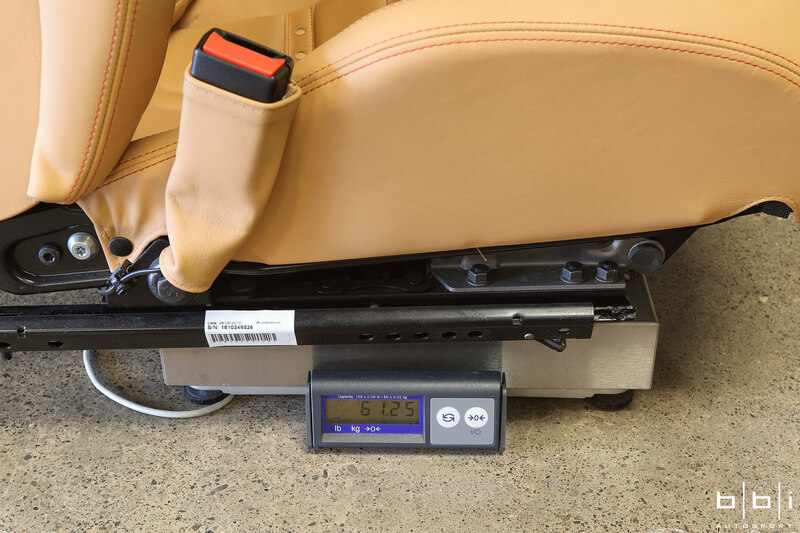 A racing seat is designed to limit body movement when properly fitted to the driver vs. OEM seats which are designed for general comfort and ease of entry/exit for a wide range of body types. 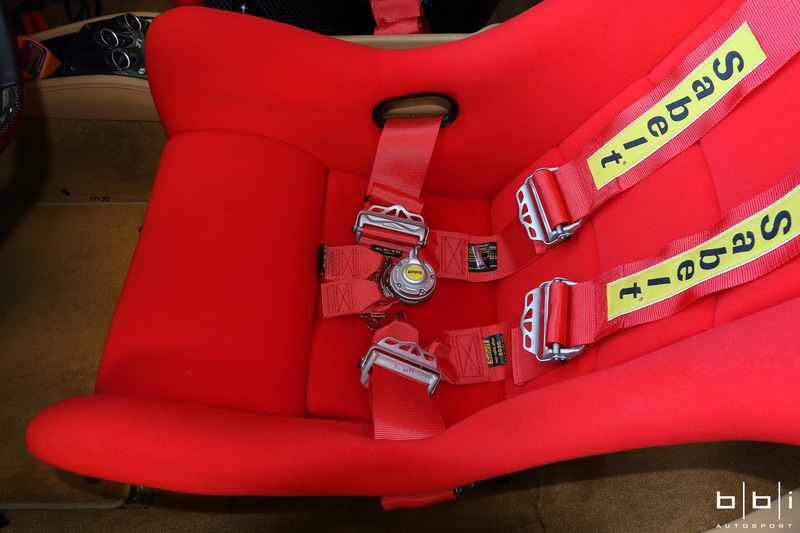 FIA approved, full bucket, racing seats also have provisions for racing harnesses, which offer a much higher level of safety and protection in the case of an accident or impact. Sabelt (part of the Brembo group) is a technology leader in safety equipment and a technical supplier to Ferrari on several OE and motorsport programs. 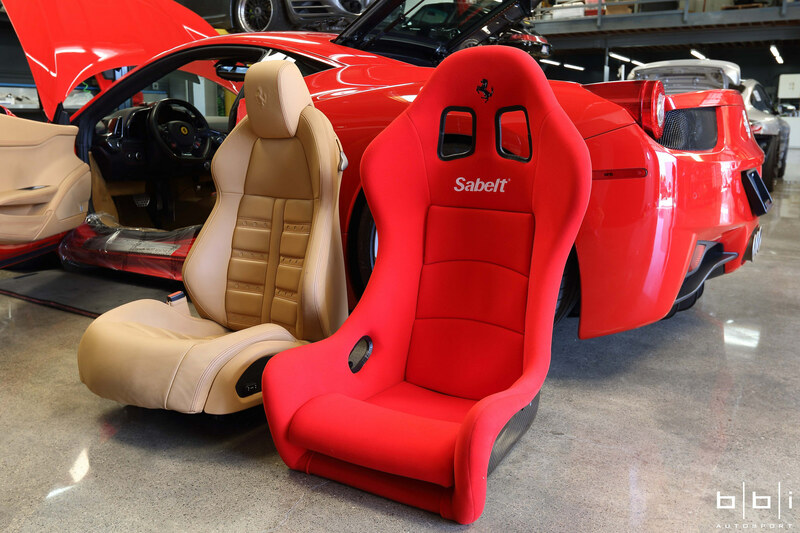 Sabelt produces the optional high performance seat options for the OE Ferrari 458 Italia and also supplies FIA approved* carbon racing seats into the Ferrari “Challenge” and GT3 customer racing programs. *What exactly does FIA Approved mean? Safety equipment which is FIA approved is rigorously tested and conforms to the same high safety standards which over 30 different motorsports series worldwide including Formula 1 conform to. Formed over 100 years ago in 1904, the FIA (Federation Internationale de I’Automobile) is a foundation which governs and regulates most aspects (including safety) of the top professional motorsports series worldwide. All of the current Sabelt racing seats are FIA approved. 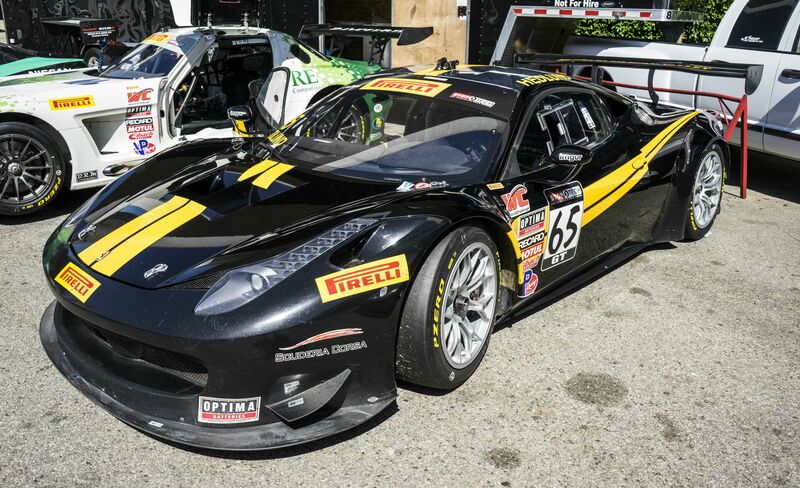 Reducing weight from the 3,280 pound (curb weight) Ferrari 458 Italia, a high performance platform already engineered using some of the lightest composites and materials on the market derived from Ferrari’s extensive background in motorsport, is not an easy job. It is made easier however when the right technical partners, suppliers and know how is involved. 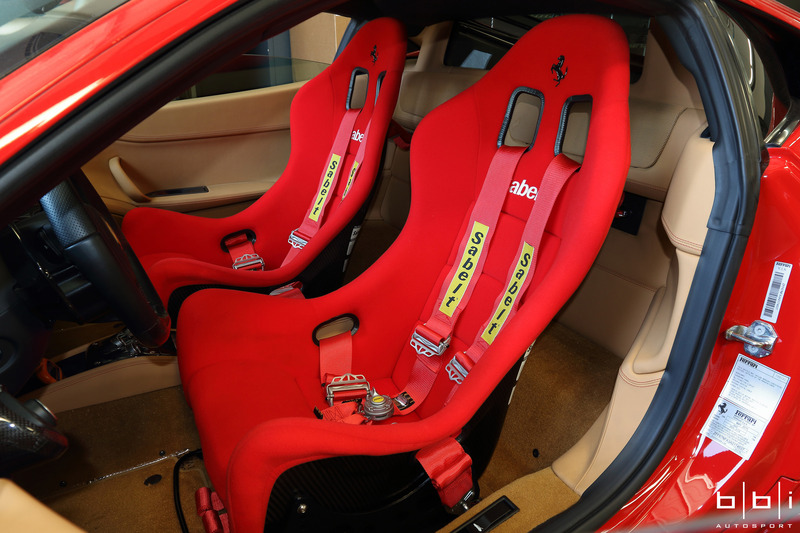 The Sabelt seats chosen for the Ferrari 458 “Street Challenge” project are Sabelt carbon full bucket racing seats (based off the Sabelt GT-600 carbon seat) supplied for the Ferrari “Challenge” series. The GT-600 is one of Sabelt’s lightest carbon seats, and has several key features which make it a great option for safety and comfort. Construction: Carbon for maximum weight savings. Ergonomic Cushion: One piece base to backrest cushion constructed from double density memory form foam helps maximize driver lumbar support and comfort. Horizontal Seams: Reduces back perspiration by increasing the circulation of air. *NOTE: as a more cost effective solution, the Sabelt GT-140 seat can also be used. It utilizes fiberglass instead of a carbon shell. With any full bucket seat designed for professional racing, one does lose the functionality of the OE nature, comfort and recline-able nature of the standard OE seat. 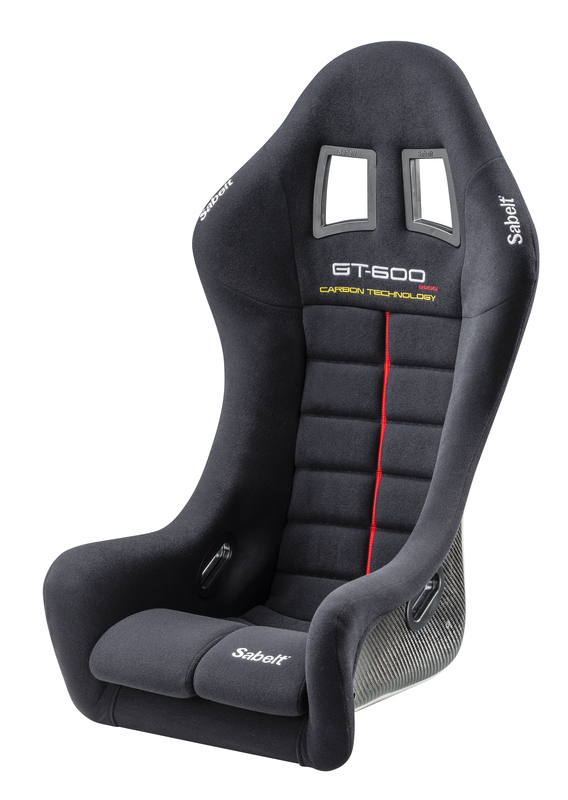 Bucket seats designed for racing are designed for maximum ergonomic comfort and protection in high performance or racing use. 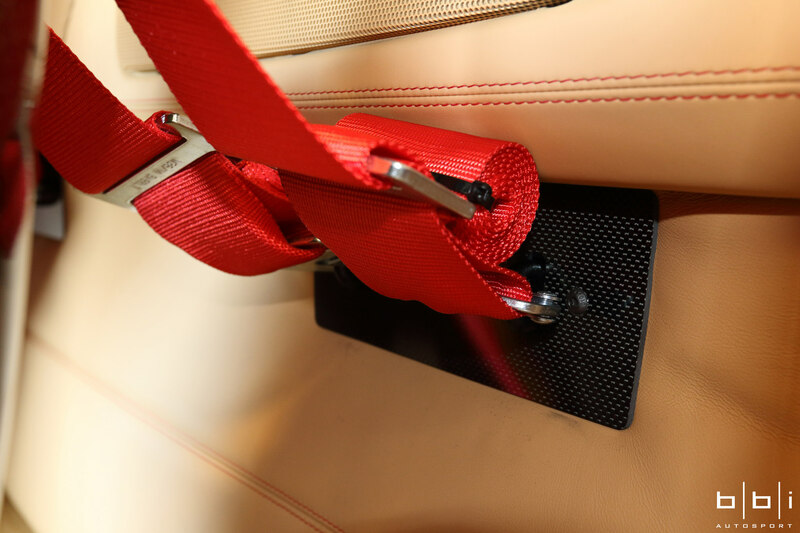 To install the Sabelt seats and belts, BBi had a seat base manufactured specifically for the Sabelt side mounts and sliders to fit into the Ferrari 458. 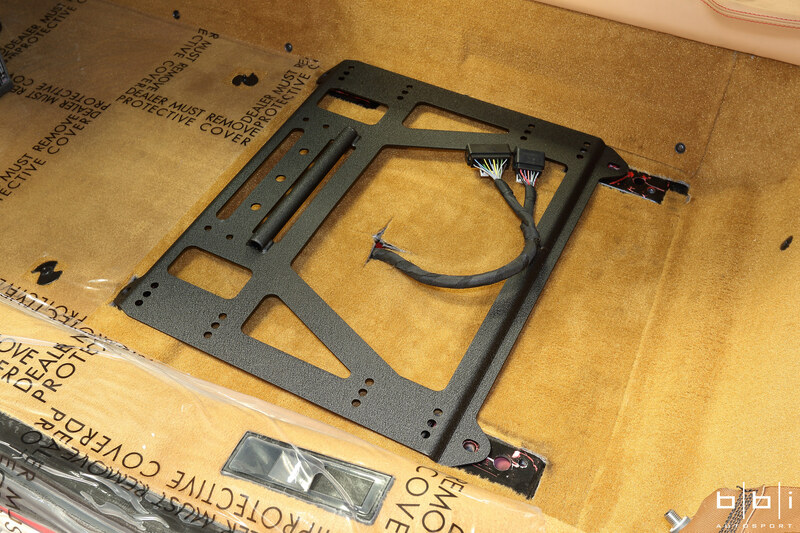 Without a vehicle specific seat base, it is impossible to install slider equipped seats in a car. 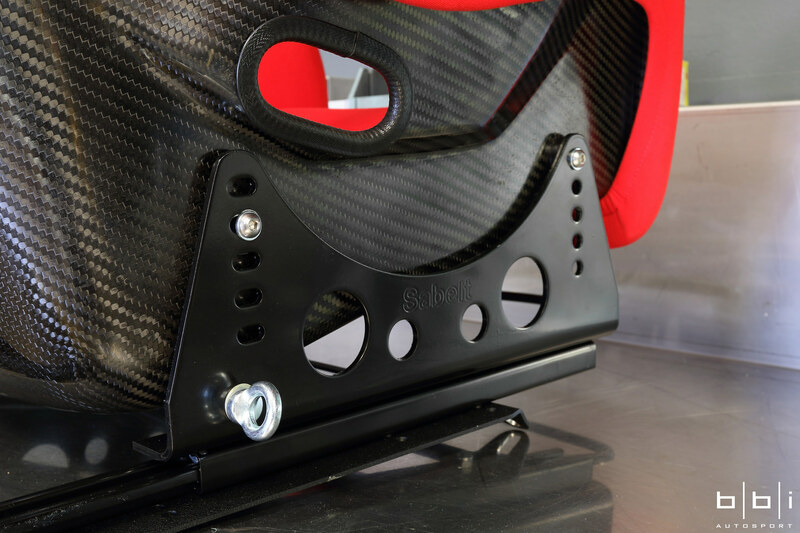 To install the Sabelt racing harnesses which would go with the seats, special mounting had to be fabricated for the harnesses behind the seats. 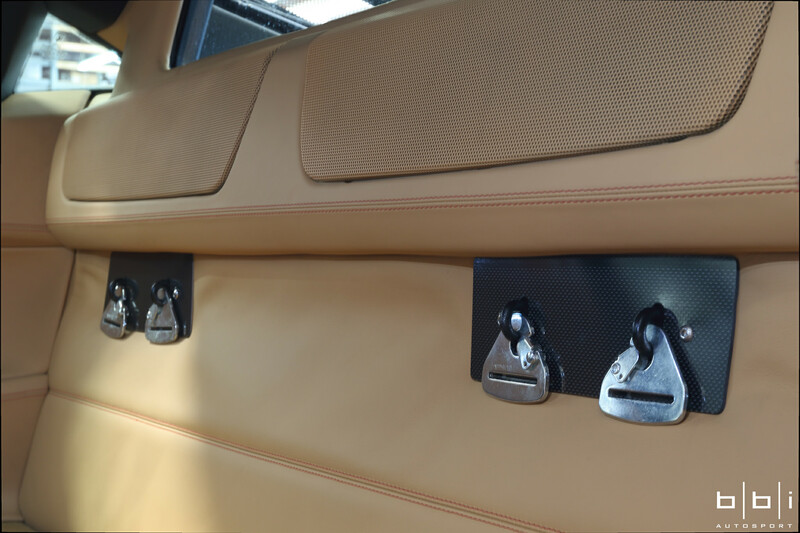 The lap belts would connect directly to the 458 Challenge specific Sabelt side mounts. – Ease of Use: Sabelt’s lightweight aluminum quick adjusters were developed to require less load on the lever, which results in an easy, fast, and fluid adjustment. In addition endurance racing where quick driver changes are critical, these have been the popular choice of top level teams and track day / club racing customers. Confidence in a properly tightened harness is important in any form of racing. 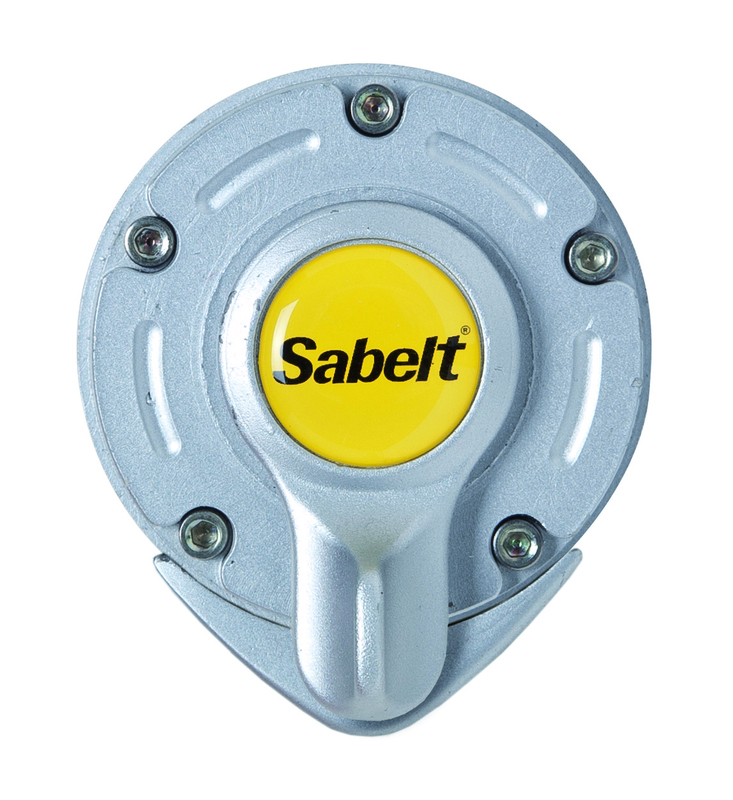 – Safety and development: Sabelt’s cam lock design has continued to set them apart in the safety industry. Since it’s introduction in 1976, Sabelt has continued to put engineering resources into the development and weight reduction of their cam locks (as well as all hardware pieces). This has been accomplished with in house manufacturing, testing, and working closely with FIA. The material used on the release lever and on the body of the cam lock is aluminum alloy (no plastic). Sabelt continues to use aluminum for a better heat / flame resistance. Even without the use of plastic, Sabelt has still been able to a produce some of the lightest weight and most functionally advance cam locks on the market. – Range / Options: Sabelt harnesses are available in a wide range of configurations to suit driver preference and applications. Some of the standard options for FIA approved belts include 4 or 6 point configuration, full 3” or 3-2” Hans friendly shoulder straps, aluminum or steel adjusters, 2 or 3 inch lap belts, “pull up” or “pull down lap belt adjustment, and snap hook (eye-bolt type) or bolt in configurations with the ability for the shoulder straps to wrap around a harness bar. Improving driver safety is always a primary concern for auto manufacturers, high performance shops and professional racing teams regardless of street, track or race use. 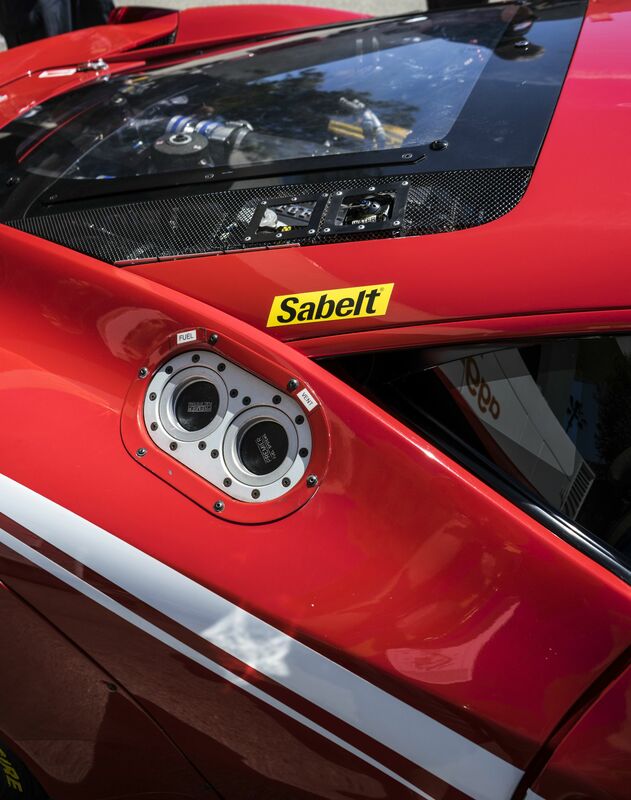 With the many years of experience in safety and professional racing with Ferrari, using Sabelt safety equipment was BBi Autosport’s preferred choice on project: Ferrari 458 “Street Challenge”. Sabelt GT-600 Medium = 13 lbs. Sabelt GT-600 Large = 13.8 lbs. Sabelt GT-600 Extra Large = 13.7 lbs. For more pictures of the BBi Autosport Ferrari 458 build, be sure sure to check out their gallery on facebook (click link).